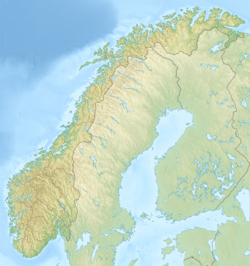 Langvatnet (Norwegian) or Guovddelisjávrrecode: sme promoted to code: se (Northern Sami) is a lake in the municipality of Ballangen in Nordland county, Norway. The 14.36-square-kilometre (5.54 sq mi) lake is located northwest of the lake Sijdasjávrre and south of the lake Geitvatnet in the southeastern part of Ballangen, about 3 kilometres (1.9 mi) from the border with Sweden. ^ Thorsnæs, Geir, ed. (2018-08-21). "Langvatnet – innsjø i Ballangen". Store norske leksikon (in Norwegian). Kunnskapsforlaget. Retrieved 2019-01-12. This page was last edited on 12 January 2019, at 20:31 (UTC).